Why Do I Need Energy Efficient Windows in Toronto? This probably goes without saying, but these days we cannot simply open our homes to “just anyone.” Unfortunately, not all companies are reputable, reliable, and employ quality contractors. So, the decision is with you: you must be stringent and meticulous in choosing the right window contractor for your home. Our team here at Brock Doors and Windows in Brampton, ON, has created an iron-clad checklist to help you choose confidently. Follow this quick list to get started on your next replacement window project! Time in business: A company that has been in business for more than seven years has been doing something right by its customers. Plainly said, a window installation company—which relies heavily on customer satisfaction and legal standards—cannot survive long employing poor business practices. Referrals and word-of-mouth: Ask around! Did your neighbors recently replace their windows? Is there a new housing development going up nearby? Don’t be shy; ask the homeowners about the company they chose for their project. Promise statements: what commitment(s) can you count on during your replacement window project? Values: is there a theme within the company site? Do they value quality work, excellent staff, fast turnaround time, family, etc.? A website can reveal a lot about a company’s character. Check them out. Better Business Bureau: The BBB is a well-known resource. Use this every time you are looking to hire a contractor for a home project/renovation. Consumer Choice Award: This honor is given for excellence in business in a handful of categories. Basically, this selection process is based on gathering consumer and company data from across Canada and awarding the businesses with the highest scores in consumer satisfaction. See what strangers are saying! Jump on Yelp.com, Guildquality.com, Ontariowindowreviews.com, and Homestars.com. Pay attention to the overall rating and the company’s response to less-than-perfect reviews. This, again, will give you some insight into the company’s character. Take advantage of free consultations and showrooms: ask your questions and listen to your gut. It will not mislead you! 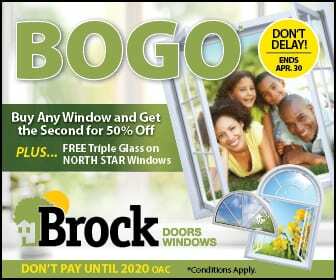 At Brock, we want you to be 100% comfortable before beginning your Brampton, ON windows replacement project. No question is silly and no concern will be overlooked. Our company has been in the window business since early 1990; we have the credentials, awards, and rapport you want to see behind your chosen contractor. We look forward to meeting you!